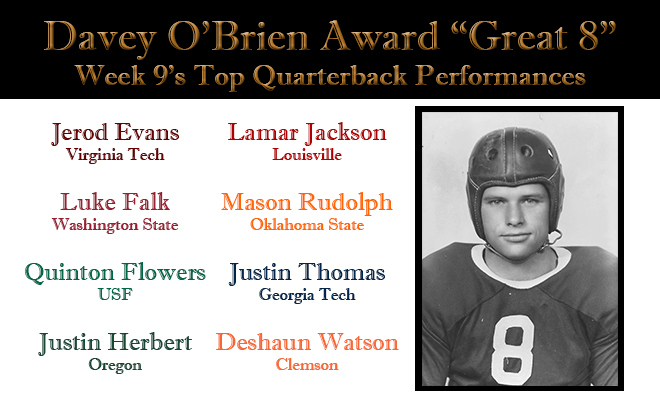 FORT WORTH, Texas (Oct. 31, 2016) – Half of this week’s Davey O’Brien “Great 8” list is made up of quarterbacks from the Atlantic Coast Conference, marking the first time ever that four members from one league have been honored in the same week. The eight honorees, as determined by voting from the award’s selection subcommittee, include: Jerod Evans of Virginia Tech, Washington State’s Luke Falk, Quinton Flowers of USF, Oregon’s Justin Herbert, Lamar Jackson of Louisville, Oklahoma State’s Mason Rudolph, Justin Thomas of Georgia Tech and Clemson’s Deshaun Watson. Jackson appears on the list for the seventh time in 2016, the most by any player in the country. Falk, Rudolph and Watson are honorees for the third time this season, while Evans and Flowers are two-time selections. Herbert and Thomas are recipients for the first time in their careers. Passed for a career-high 406 yards and threw a pair of touchdown passes, and also added 33 rushing yards, in a 39-36 victory over Pittsburgh. Threw for five touchdowns and 415 yards with no interceptions (33 of 46) as the Cougars rallied from a 24-6 halftime deficit to beat Oregon State, 35-31. Carried 13 times for 176 yards and two touchdowns and threw for 219 yards (19 of 29) and a pair of scores as USF upset No. 22 Navy, 52-45. Justin Herbert, Oregon, Fr., 6-6, 225, Eugene, Ore. Broke the school’s total offense mark with 512 yards and matched the Oregon record with 489 yards passing (31 of 42), while tossing four touchdowns against Arizona State. Helped Louisville to a 32-25 win over Virginia with his fourth TD pass of the game with just :13 left to finish 24-for-41 for 361 yards to go along with 88 rushing yards. Guided the Cowboys to a 37-20 win over No. 10 West Virginia by accounting for four touchdowns (three passing) and going 26-for-36 for 273 yards. Justin Thomas, Georgia Tech, Sr., 5-11, 185, Prattville, Ala. Rushed 17 times for 195 yards and two scores and connected on 10 of 14 attempts for 264 yards and two touchdowns in a 38-35 victory over Duke. Led Clemson’s 37-34 late comeback win over No. 12 Florida State by completing 27 of 43 passes for 378 yards and two touchdowns and adding 52 rushing yards.